McCall (DENZEL WASHINGTON) has it in for Teddy in Columbia Pictures’ THE EQUALIZER. ©CTMG. CR: Scott Garfield. 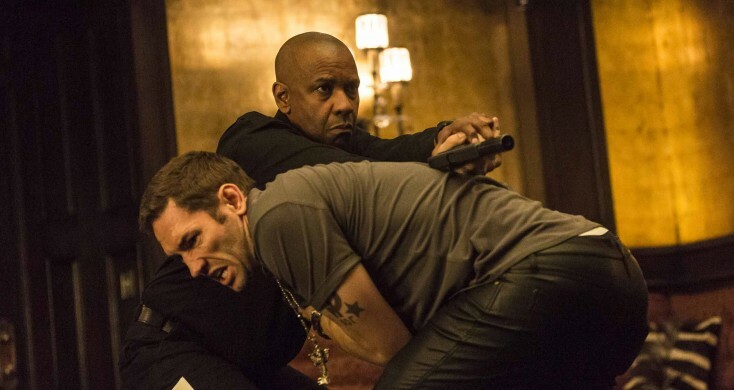 Amid the staple-gunning, eye-gouging, neck-drilling action that is “The Equalizer,” lies a little character development; the kind that still allows 59-year-old superstar Denzel Washington to rule the cinema when it comes to everyman heroes. A predictable and logic-lacking plot doesn’t help but Washington still commands the screen forcing the audience to hang on his every expression. Boston nice guy Robert McCall (Denzel Washington) works at a Home Depot-like warehouse where he’s encouraging and uplifting to everyone around him, especially Ralphie (John Skourtis) who dreams of making the store’s security guard team. McCall is an insomniac who frequents an all-night diner in the wee hours to read classics like “The Old Man and the Sea” and “Don Quixote.” It is there that he befriends Elena (Chloe Grace Moretz), a young Russian prostitute who wants a music career. When Elena is badly beaten by her Russian pimp, something clicks inside McCall’s well-disciplined head and he tracks the pimp down, calmly offering his saved $9,800 to buy her freedom. When this offer is smugly rejected, McCall sets his stopwatch and, in the style of Robert Downey Jr.’s Sherlock Holmes, watches, weighs and measures every possibility in the room before destroying the pimp and his slimeball thugs in 29 seconds flat. After a secret visit to his old boss Susan (Melissa Leo), a CIA-like covert ops officer, McCall feels he not only knows more about his enemies but he has “permission” to off them in his special, fine-tuned way. McCall’s methodical actions attract not only the crooked cops who work for the Russian mafia but brings to town crime Czar Puskin’s (Vladimir Kulich) ultimate enforcer, the very evil Teddy (Marton Csokas) and the rest of the film pits the two on a head-to-head collision course that ends on McCall’s home turf, that big Home Depot-like warehouse. Of course, only one of them will emerge alive. Based on a 1980’s TV series of the same name with Edward Woodward, a much less violent Robert McCall in the title role, “The Equalizer” tries to be “smart” in that the books McCall is reading parallel his own story: first, an older man accepting of his fate, eventually destroyed but not defeated, then a re-ignited Don Quixote tilting against seemingly overwhelming odds. In his quiet moments reading, contemplating and guiding his co-workers toward better lives, Washington is just as commanding and effective as he is when violently offing his enemies. A chink in the story’s armor exists when, once activated, McCall becomes just too Superman, as he’s only occasionally injured or superficially wounded. We never feel that he’s ever really in danger. We also wonder why the Russian baddies, who know right away that his sentimentality is this hunter/killer’s Achilles’ heel, wait until the last act of the film to use this against him. Why not grab his buddies at Home Depot earlier or yank his young female friend out of the hospital right away? Perhaps, it’s because the construction of the story would fall apart. 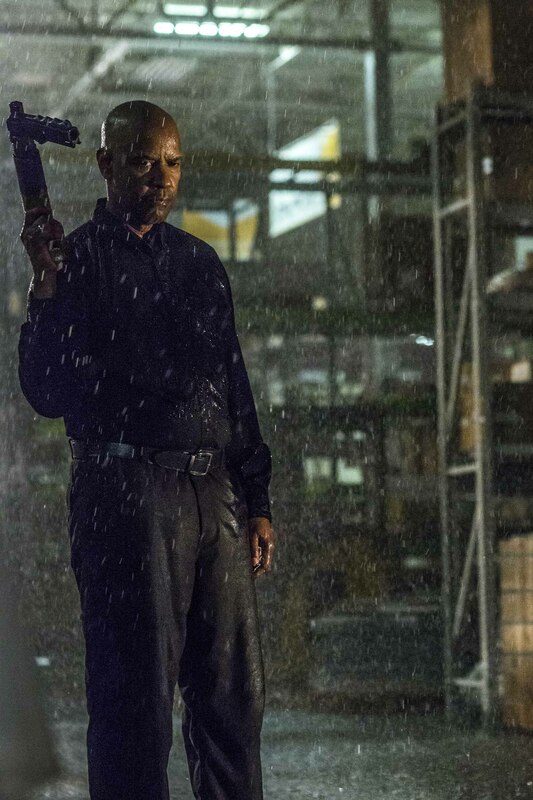 “The Equalizer” is about 30 minutes too long partially due to director Antoine Fuqua’s slo-mo action and hero shots like Washington parading his victory through Home Depot in the rain of the set-off sprinkler system. Washington looks pretty hot at 59 and his everyman appeal will only be bolstered by this violent kill fest. Despite story holes and maybe too much action, you do catch yourself rooting for McCall and even look forward to just what cool killing method he’ll come up with next. With journalists and aid workers being cruelly beheaded by terrorists, the civilized world is in a real payback mood, so this revenge-actioner with a solid superstar at the helm likely will perform well at the box office.